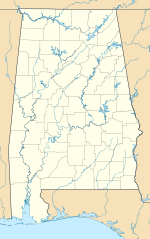 Jackson Municipal Airport (FAA LID: 4R3) is a city-owned public airport two miles south of Jackson, in Clarke County, Alabama. This airport is in the FAA's National Plan of Integrated Airport Systems for 2011–2015 and 2009–2013, both of which called it a general aviation facility. Jackson Municipal Airport covers 112 acres (45 ha) at an elevation of 62 feet (19 m) above mean sea level. It has one runway, 1/19, 5,003 by 80 feet (1,525 x 24 m) asphalt. In the year ending July 15, 2010 the airport had 2,800 general aviation aircraft operations, an average of 233 per month. ^ a b c FAA Airport Master Record for 4R3 (Form 5010 PDF). Federal Aviation Administration. Effective 25 August 2011. ^ "2011–2015 NPIAS Report, Appendix A (PDF, 2.03 MB)" (PDF). 2011–2015 National Plan of Integrated Airport Systems. Federal Aviation Administration. 4 October 2010. Archived from the original (PDF) on September 27, 2012. ^ "2009–2013 NPIAS Report, Appendix A: Part 1 (PDF, 1.33 MB)" (PDF). 2009–2013 National Plan of Integrated Airport Systems. Federal Aviation Administration. 15 October 2008. Archived from the original (PDF) on August 6, 2011. This page was last edited on 2 October 2018, at 20:30 (UTC).